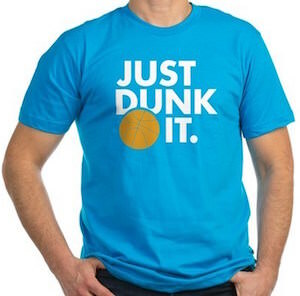 If you like basketball then you are going to like this Just Dunk It t-shirt. On the t-shirt you can see an orange basketball and around the ball you find the text in white that says “Just Dunk It.”. You can get this t-shirt in many styles and colors for both men and women and yes many sizes are available to because not every basketball fan wears the same size. So if you want to shoot some hoops then why not do it in this t-shirt as it already explains that dunking that ball is what it is all about.